Section 51A in cases where there is no invocation of fraud / suppression / mis-statement etc and Section 51B where the ingredients of fraud / suppression / mis-statement etc are present. The person chargeable with tax pays the amount of demand along-with interest before issue of notice under section 51A. In such cases no notice can be issued by the proper officer. Where the person to whom a notice has been issued under sub-section (1) of section 51A, pays the tax along with interest within 30 days of issue of notice, no penalty shall be payable and all proceedings in respect of such notice shall be deemed to be concluded. The relevant date is the date of filing of annual return where such returns of actually filed or where such returns are not filed, the due date for filing of annual return. There is no time limit to issue show cause notice. However the issuance of Show cause notice and adjudication of the case has to be completed within the period of 3 years (for Section 51A cases) and 5 years (for Section 51B cases) from the relevant date. The person chargeable with tax pay the amount of demand along-with interest before issue of notice under section 51. Before issue of notice under sub section (1) or a statement under sub-section (2), a person chargeable with tax, shall have an option to pay the amount of tax along with interest and fifteen percent penalty, ascertained either on his own or informed by the proper officer, and on such payment, no notice shall be issued with respect to the tax so paid. If tax/ interest and penalty has been paid. Where the person to whom a notice has been under sub-section (1) issued, pays the tax along with interest with twenty five percent penalty within 30 days of issue of notice all proceedings in respect of such notice shall be deemed to be concluded. A notice is adjudicated under section 51B and order issued confirming tax demand and penalty, the notice have any option to pay reduced penalty. He needs to pay tax/interest and 50% of penalty within 30 days of communication of order. Where any person served with an order issued under sub-section (6) of Section 51B pays the tax along with interest and a penalty equivalent to fifty percent of such tax within thirty days of the communication of order, all proceedings in respect of the said tax shall be deemed to be concluded. The model GST law provides for deemed conclusion of the adjudication proceedings if the order is not issued within 3 years as provided for in section 51A (7) or within 5 years as provided for in section 51B(7). 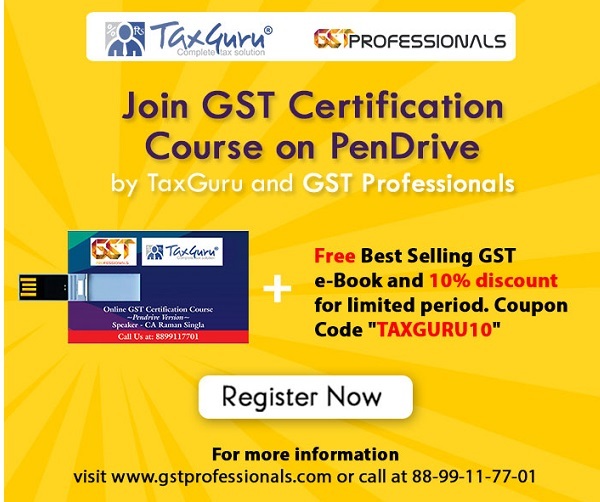 As per Section 52 of MGL, every person who has collected from any other person any amount as representing the tax under this Act, shall deposit the said amount to the credit of the Central or State Government, regardless of whether the supplies in respect of which such amount was collected are taxable or not. Notice to be issued. Principles of natural justice to be followed and order to be issued. It is to be noted that such order has to be invariably issued within 1 year of date issue of notice. However there is no time limit for issue of show cause notice. Thus, in cases duty can be recovered even after ten years. Notice can be issued on detection such cases without any time limit. Once notice is issued, the order has to be passed within 1 year from the date of issue of notice. 5. The proper officer may prepare a certificate signed by him specifying the amount due from such person and send it to the Collector of the district in which such person owns any property or resides or carries on his business and on receipt of such certificate, the Collector shall proceed to recover from such person the amount specified as if it were an arrear of land revenue. The proper officer allow payment of tax dues in installments. In cases other than self-assessed tax. The Commissioner/Chief Commissioner may extend the time for payment or allow payment of any amount due under the Act, other than the amount due as per the liability self-assessed in any return, by such person in monthly installments not exceeding 24, subject to payment of interest under section 36 with such restrictions and conditions as may be prescribed. However, where there is default in payment of any one installment on its due date, the whole outstanding balance payable on such date shall become due and payable forthwith and recovered without any further notice. The notice of demand is required to be served only in respect of the enhanced due. In so far as the amount already confirmed prior to disposal of appeal / revision, the recovery proceedings may be continued from the stage at which such proceedings stood immediately before such disposal. Where any person liable to pay tax, transfers his business in whole/part, by sale, gift, lease, leave and license, hire, or in any other manner, then such person and the person to whom the business is transferred shall jointly and severally be liable to pay the tax, interest or penalty due from the taxable person up to the time of such transfer, whether such dues has been determined before such transfer, but has remained unpaid or is determined thereafter. When any company is wound up and tax or other dues determined whether before or after liquidation that remains unrecovered, every person who was a director of the company during the period for which the tax was due, shall jointly and severally be liable for payment of dues unless he proves to the satisfaction of the Commissioner that such non-recovery is not attributed to any gross neglect, misfeasance or breach of duties on his part in relation to the affairs of the company. Partners of any firm shall jointly and severally liable for payment of any tax, interest or penalty. Firm / partner shall intimate the retirement of any partner to the Commissioner by a notice in writing – liability to pay tax, interest or penalty up to the date of such retirement, whether determined on that date or subsequently, shall be on such partner. If no intimation is given within one month from the date of retirement, the liability of such partner shall continue until the date on which such intimation is received by the Commissioner. Where the business in respect of which any tax is payable is carried on by any guardian / trustee / agent of a minor or other incapacitated person on behalf of and for the benefit of such minor / incapacitated person, the tax, interest or penalty shall be levied upon and recoverable from such guardian / trustee / agent. Where the estate of a taxable person owing a business in respect of which any tax, interest or penalty is payable is under the control of the Court of Wards / Administrator General / Official Trustee / Receiver or Manager appointed under any order of a Court, the tax, interest or penalty shall be levied and recoverable from such Court of Wards / Administrator General / Official Trustee / Receiver or Manager to the same extent as it would be determined and recoverable from a taxable person.